Aquaponics is a self contained sustainable system for growing fish and veggies. 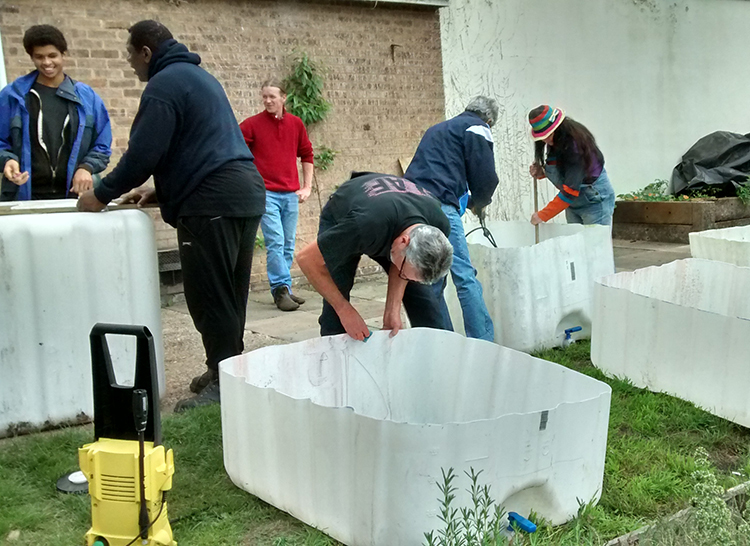 At Graceworks we were joined by Darren Woods who demonstrated a backyard aquaponics system. We all had a chance to put a system together and build our own syphon. Modern aquaponics is slightly more high-tech, but it's still an efficient and environmentally friendly way to produce food. Fish are kept in large tanks and the plants are grown hydroponically; that is, without soil. They are planted in beds with a little gravel or clay and their roots hang down into the water. The water is cycled through the system, so that it collects the "waste" from the fish; then it’s pumped to the plant beds, where it is filtered naturally by the plants and can then be returned to the fish tanks. Unlike traditional farming methods, no chemical fertilizers are needed for the plants: they all come from the fish-waste. It also organic, because the use of pesticides would be damaging to the fish. Graceworks is currently designing and building a system in the poly-tunnel on our Evington site. Below is a video some students put together to show a simple indoor aquaponics system.